Open Europe: Take your pick Mario: Bond-buying or the Pickelhaube! Take your pick Mario: Bond-buying or the Pickelhaube! 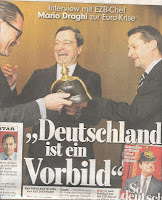 Mario Draghi's head-wear selection could soon be smaller after Bild threatened to take back the authentic 'Pickelhaube' - the famous 19th Century Prussian military helmet - they bestowed upon him a few months ago to remind him of strict budgetary oversight and economic stability (see photo). Draghi responded by saying he was honoured, and that "Germany served as an example in the crisis". However, with more investors and politicians looking towards the ECB for salvation, Draghi has indicated that he is prepared to accept a more activist role for the ECB, pledging that, "Within our mandate, the ECB is willing to do whatever it takes to preserve the euro and, believe me, it will be enough". This has been widely interpreted as an announcement that the ECB will re-start buying government bonds to reduce Spain and Italy's unsustainable borrowing costs. Today's Süddeutsche reported that Draghi is working on a ‘dual strategy’ whereby the eurozone’s new permanent bailout fund, the ESM, would – following an official request from an affected country – buy bonds on the primary market, while the ECB would intervene on the secondary market (similar to the 'concerted action' described by Le Monde last week, which we discussed here). 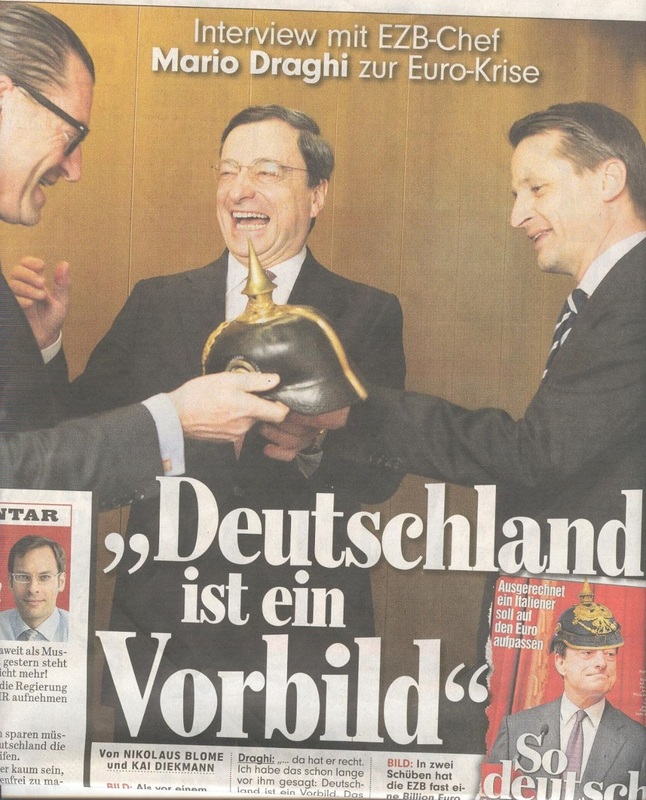 Way too much for Bild, which today has a headline reading, “No more German money for bankrupt euro states, Herr Draghi!”, adding "or else we will take our Pickelhaube back!" Will this threat be enough to make Draghi think twice? 1. It starts to look that we are coming in the endgame. When clever people like Draghi and Monti start doing strange things it is probably a good indication that we are there. 2. Very bad timed strategy btw. First of all: a Spanish bail out now likely/possibly means ECB buying. This while the bail out itself should still be approved everywhere. This will not make that more likely to say the least. Also doing this before the ruling by the Constitutional Court. Which now sees before they have to make a ruling, that it won't be the last case. Likely the present ESM is way too small anyway and next to that ECB buying means simply further rescue but only more indirectly. But nevertheless at the end to be backed by German taxpayers and as far as the ECB goes without budgetary control of the German parliament. Opening anew can of worms overthere. 3. As said earlier, buying on the secundary market is the least effective way. You can only optimise its ineffectiveness more by buying from Banks that cannot easily sell (because they would have to account for the loss made). Or by making the target rate rather low (which makes arbitrage even more profitable). 4. Looking at the German papers its looks that the German population really starts to have enough of other people spending their money. This looks like trying to push it through their throat. 5. Anyway we won't see much. Only interest down 1/4 that will not bring Europe back on track. Bondbuying under the condition that a) there is a MOU (and rescue plan) and b) an ESM buying on the primary market as said implicates that ESM and Spanish bail out will have been approved. Especially with the ECB coming to the rescue that is in no way certain. 6. Looks pretty stupid of Draghi the have brought this up this way and at this stage without Buba and German politics consulted. He puts himself in the middle of 2 highly political discussions (Spain's bail out, with possibly an increase of capacity required and ECB intervening and independence). 7. Watch the Dutch parliament today as well, they have a special specialist session on the rescue. One more point it should have been better hidden. Saying it is policy to get grip on the monetary markets and no state financing (not allowed) while at the same time demanding ESM buying as well combined with Spain agreeing to a lot of conditions simply donot go together. I think I messed the par on interestrates up. Had some computer problems and was clearly to distracted to do it even remotely right. My excuses for that.